The Digital Research Library of Illinois History Journal™: The History of Fort Beggs (1832) in Walkers' Grove, today's Plainfield, Illinois. The History of Fort Beggs (1832) in Walkers' Grove, today's Plainfield, Illinois. Fort Beggs in Walkers' Grove, Illinois (the Plainfield area was called Walkers' Grove until it was platted as Plainfield, Illinois in 1841) was an impromptu fort used for one week in May during the 1832 Black Hawk War. The appearance of the fugitives, some on foot, some on horse-back, and some in wagons, some bare headed and bare footed, and crying out "Indians! Indians!" was the first notice that the settlers at Walker's Grove and vicinity had got of their danger. The consternation produced can better be imagined than described. It was at this moment that they resolved to leave as soon as possible and were in the midst of deciding whether to flee to Ottawa, Illinois or Chicago when James Walker urged them to wait until the rest of the men returned. During this wait the settlers had built a wall around the fort out of old fencing and set it on fire so that they might see an attack coming during the night. The leading men in the settlement hastily consulted together as to the best course to be adopted. Some were for flight in one direction or another. It was concluded that the best course at least for the present, was to get together and make a defense. The cabin of Father Stephen R. Beggs on section16, was thought the best one for the purpose, and accordingly they gathered there and hastily put it into the best condition to resist attack. By common consent Captain James Walker, a man of great energy and good judgment, was made Captain of Militia on June 25, 1832. Barricades were erected by tearing down fences and out-buildings, and they soon had a stronghold which became known as "Fort Beggs." Father Beggs' cabin was converted to a fort on a Thursday. Sketch of Fort Beggs. 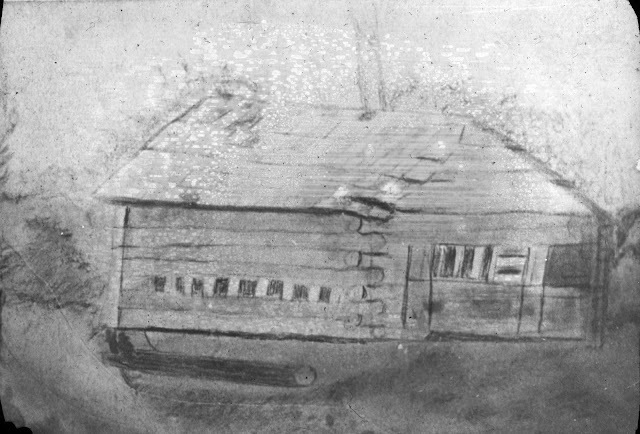 This picture was no doubt sketched by someone who was familiar with the old log house that was at one time Fort Beggs, and gives something of the general shape of the building. The breastwork was a temporary affair according to Beggs' history. The people stayed here a short time and then went to Fort Dearborn at Chicago and did not return until mid-summer and fall. Everything that could be of service as a means of defense, such as axes, pitch-forks, etc., were collected and brought to the fort. The women made themselves useful in melting up their stock of pewterware, more valuable then than silverware now, and running musket balls. Only four guns, however, could be mustered that could be relied upon. Here they remained in anxious suspense for several days expecting every moment to hear the yells of savage foes coming to attack them. The following families and persons were living in this vicinity at this time: Jesse Walker,the pioneer missionary, and family; James Walker and family; Reuben Flagg and family; Timothy B. Clark and family; Rev. Stephen R. Beggs and family; John Cooper and family; Chester Smith and family; Wm.Bradford and family; Peter Watkins and family; Samuel Shively and family; Thos. R. Covel and family; James Matthews and family; Mr. Elisha Fish and family; Rev. Wm. See and family; Chester Ingersol and family; James Gilson and family; Robert W. Chapman, James Turner, Orrin Turner, John Shutleff and Jedediah Wooley, Sr. These, with the fugitives from Fox river, made the number, old and young, gathered in Fort Beggs, one hundred and twenty-five. As you can imagine the cabin was uncomfortably full. By Sunday a group from Chicago being composed of both settlers and Native Americans had come to rescue them. It consisted according to most accounts of twenty-five or thirty mounted men. Some accounts say it was under command of Captain Joseph Naper of the Naper settlement which was next to Walkers' Grove, while others say it was commanded by Captain Sisson, from the Yankee settlement, and in other accounts it is spoken of as Captain Brown's company. It is probable that all these persons were along, and being active men in getting it up, were all captains. There is no other way to reconcile the different statements. It is known from conversations with Mr. Sisson that he was with the company. At the same time Lawton, above named, a man who had settled on the Desplanes river, near the present village of Riverside, and who was well acquainted with the Indians, and had a squaw for a wife, with about the same number of friendly Indians accompanied the mounted rangers. They stayed the night of the 21st at Lawton's place, and on the next morning Lawton and his company started for the Big Woods (a forest property in Joliet, Illinois, home to Fort Le Pouz. Today the park is called Pilcher Park which was previously known as Higginbotham Woods; owned by early settler Henry D. Higginbotham, before that it was called the Big Woods.) settlement, near the present town of Joliet, where there was at the time an encampment of Potawatomi. The rangers struck for Holderman's. They agreed to meet at the cabin of George Hollenbeck. The company arrived at Plainfield and stayed overnight and then proceeded on to Holderman's grove. They met Cunningham and Hollenbeck on the way who informed them of the destruction of their property, telling them it was useless to go farther. Notwithstanding this, they went on to Holderman's, and stopped overnight, from whence they sent an express to Ottawa to notify the settlers of the safety of their property. This express returned early next morning with the news of the massacre on Indian creek. They then went to Ottawa and from thence to the scene of the bloody tragedy, where they collected and buried the remains. The scene presented was horrid beyond description. While the company was engaged in this painful duty, Lawton, after going to the Big Woods, had gone to the cabin of Hollenbeck, where, instead of meeting the rangers, he found himself in the company of a hundred hostile Indians, who took him prisoner and threatened to kill him, but his relations with and knowledge of Indian character served him a good purpose. He had old friends in the crowd who effected his liberation, when he and his companions hastened with all speed for Fort Beggs, reaching it with the news as before stated. He supposed that the company of rangers had been all butchered. The visit of Lawton greatly increased the excitement and consternation at the Fort. Father Beggs says: "The stoutest hearts failed them, and strong men turned pale, while women and children wept and fainted," The first impulse of most was to seek safety in flight. But this might be jumping out of the frying pan into the fire. Mrs. Flagg, a woman of great judgment and resolution, strongly supported those who thought it best to "hold the Fort." To this decision, most fortunately, they came. It was afterwards ascertained that there were Indians lying in wait for them. They made what preparations they could to meet the attack of the redskins. They built bon-fires and kept them burning around -the Fort all night, so that the approach of the enemy could be seen. On the second day after Lawton's visit the rangers put in their appearance on their return, bringing the news of the Indian creek massacre and other outrages. It was then unanimously concluded to go under the protection of the rangers to Chicago. A party of Indians were lying in wait for them at Flagg creek, but seeing they were so well protected did not venture to attack. On Monday, the group had split up with some reconnoitering along the Fox River and the others (mostly Native Americans), led by Mr. Lorton (possibly David Lawton), going to meet up with General Brown, Colonel Hamilton and their men near Aurora, Illinois. This never happened because they were captured en route but the Native Americans were "on good terms with Black Hawk" and were allowed to go free. Mr. Lorton, while on his way back to Chicago, briefly returned to Fort Beggs, told them what had happened and explained that an attack would come later that night. While here, expecting every hour to be attacked, their fears were greatly increased by the visit of Lawton, with some friendly Indians, who reported the country full of hostiles and advised the people in the fort to leave at once for Chicago's Fort Dearborn, He made but a brief stop, he and his company hurrying on to that place. Captain Naper returned with his men on Wednesday evening, brought word of a massacre on Indian Creek and advised them to leave immediately for either Ottawa or Chicago. 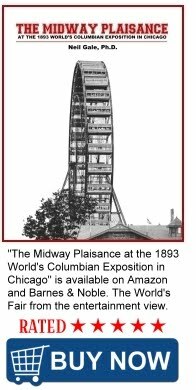 The settlers chose the flee to Chicago, made their preparations, and left the next day, on Thursday, for Fort Dearborn. 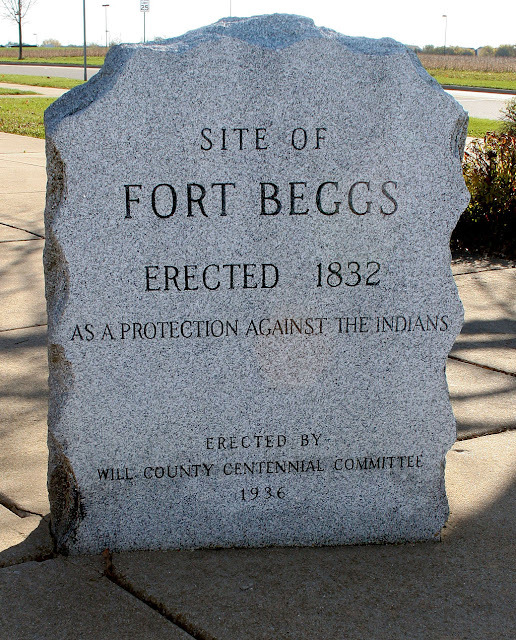 Fort Beggs was located on the DuPage River and a monument was erected by the Will County Centennial Committee in 1936 to mark its location. The location of the Fort is marked with a monument at the corner of Fort Beggs Drive and South James Street. 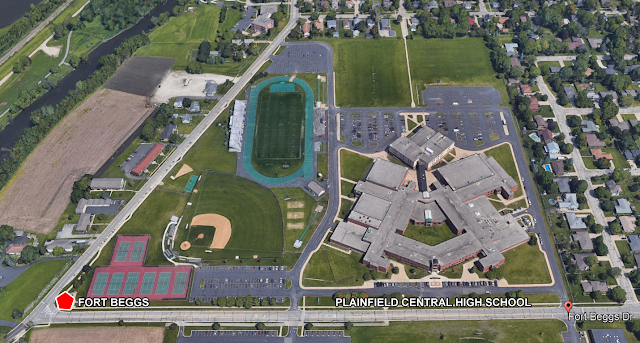 Plainfield Central High School was built after the big 1990 Plainfield tornado. Captain Joseph Naper (1798–1862), was an early Illinois pioneer, ship captain, shipbuilder, businessman, surveyor, state militia officer, soldier, politician, and city planner. In 1831, Naper and his brother John were credited with founding the Naper Settlement, the oldest Illinois community to be established west of Chicago's Fort Dearborn. Naper's Settlement would be renamed Naperville, becoming the oldest town and first county seat of DuPage County, Illinois.